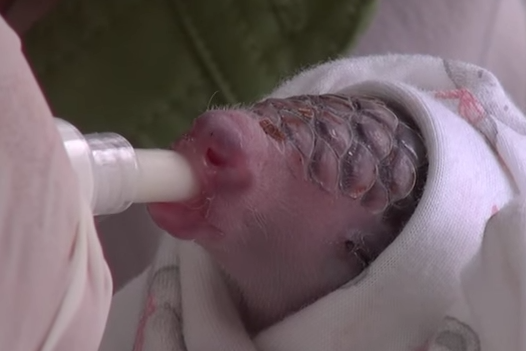 Meet Gung-Wu, a cute baby pangolin born on 9/30/2014, in Taipei Zoo, Taiwan. Gung-wu was born healthy but it had problems breast-feeding its mother and soon its weight dropped from 133 to 113 grams. On October 2, the zookeepers began hand-feeding it artificially using a pipette. For now all appears to go well and the cub will most probably have a full and healthy life. "Failed to work with her mother for feeding, the keepers took her away for bottle feeding. Starting from hourly feeding, her weights came up to 313g from 113g. Now she is used to be feed every 4 hours, a little pat on the back, special shower treatment, a little explore as exercise, arm climbing as she should do naturally with her mom to move around, she will roll herself up and becomes a ball to sound sleep."